I am drawn to sustainable, industrial components, reclaimed objects and materials that require multiple processes. The research, exploration and formation of these materials are at the very core of my practice. Interpretation, evolution and the re-invention of adornment are critical concepts to my creations. Collectively, body adornment is redefined through my contemporary vernacular. The foundation of my work is to bring industrial and cultural building blocks of our daily environment into the viewer’s focus. From recycled skateboards holding the rider’s footprint to cast concrete, a trademark of masons, my materials all have inherent beauty, strength and value beyond their functioning identity. Using these undervalued and overlooked items, I hope to evoke discussions of memories and raise questions of what jewelry is and can be, while conveying my idea that jewelry is and can be anything the wearer desires. 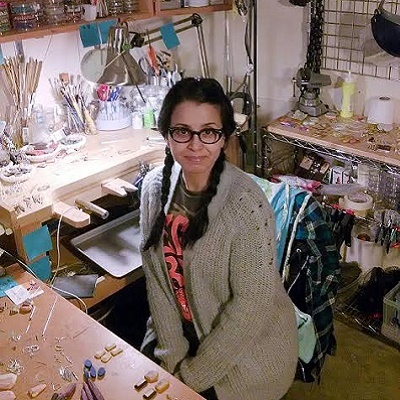 Tara currently resides in Raleigh, NC where she continues her work as a studio jewelry artist.